First of all, let me give everyone a huge THANK YOU for the sweet comments on my magazine feature post! I certainly felt loved. One of the great things about being a blogger is all the support you get when you have something big happen in your life, whether it be good or bad. It was so nice to be able to share my news with everyone. Today, I'm participating in a blog tour. I was invited by Penny at The Comforts of Home. I've been following her for years, even before I started blogging. I remember when her blog had a different name! She mostly blogged about her beautiful mosaic creations back then. She and her husband have purchased and renovated many homes in their lifetime. It's amazing to see the before and after's! 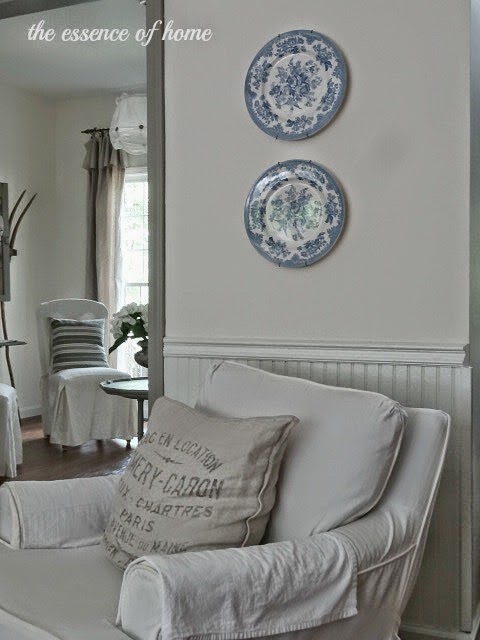 She currently lives in a beautiful home in NC that she renovated into a french country style. But I'm most jealous of her incredible back yard space! Ok........let's get this tour started! I'm supposed to answer these 4 questions. Well, I'm not working on any major or very exciting projects at the moment. I'm actually working on cleaning and sprucing up our front porch. (So it can live up to the picture in the magazine.) I have a lot of things that need to be done though. I need to update our master bathroom. I hope to get to that some time this year. I also need to repaint our garage interior and clean up our basement. Those just don't sound very fun though. Any volunteers??? This question threw me off for a minute. My work? Well, maybe they mean my blog. 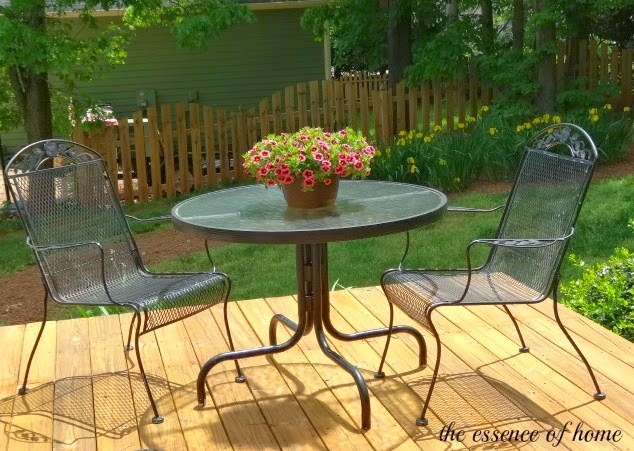 My blog is a home decorating/home cooking/gardening/family blog. I think there are dozens out there just like mine. The only thing I can say that makes mine different is that it's about MY home/MY cooking/MY garden/My family. I love sharing all of these with everyone and hope that it brings some inspiration to others the way their blogs do for me. I enjoy sharing my home with other people. I like the interaction that goes along with blogging. It's like a cyber world of like minded people that I wouldn't normally get the chance to meet any other way. 4) How dos your writing/creating process work? I'm not usually a spontaneous style person. I'm a planner, list maker, organizer etc. However, when it comes to blogging, I often just do it "on the fly". I literally come up with something to write about very close to the time I sit down and do it. I don't do a lot of planning (except for blog tours like this). I often write about what I'm passionate about that day. What my inspirations are or something new that I want to share. That's it. I try to keep my blog fun and not write for the sake of writing. So, now that I've shared a little bit about myself. It's time to pass the baton over to these 3 lovely bloggers that I've chosen. They will participate in this tour next Monday, June 23rd. These are blogs that I enjoy visiting and I think you will too. They all have one very important trait in common. They are very sweet attentive bloggers. If you visit them, you will make friends with them instantly!! She started her blog over a year ago. 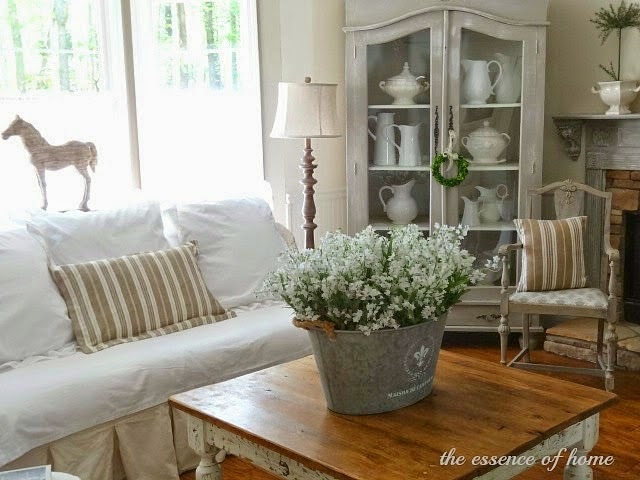 She blogs about traditional decorating and sharing simple and inexpensive home decor tips that she has learned. She likes to share holiday decor and recipes as well. She lives in a house in the Pacific Northwest. 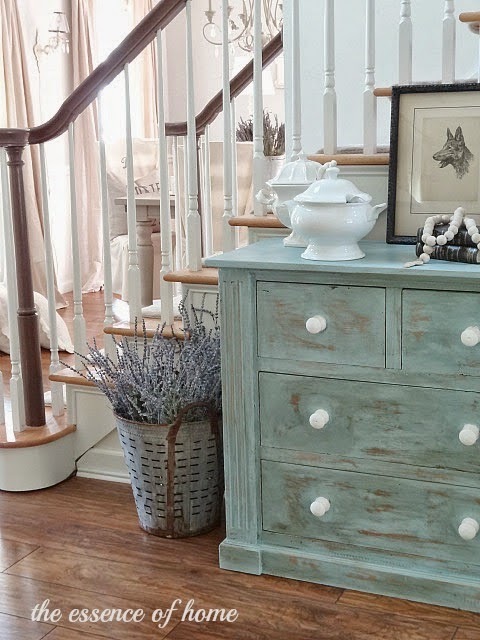 She blogs about her casual eclectic style that includes many DIY projects and rustic accents. And watch out for the most adorable bunny, she owns, that you've ever seen! She writes about life in a tiny California beach cottage. She shares decorating and gardening along with creative projects such as hand painted pillows and signs. She loves attention to detail and is constantly tweaking things around the house. I hope you enjoyed this little tour of mine. Be sure to check out more tours next Monday! Great post. I love your style and I too am so thrilled for you about the magazine feature. That is totally fabulous. 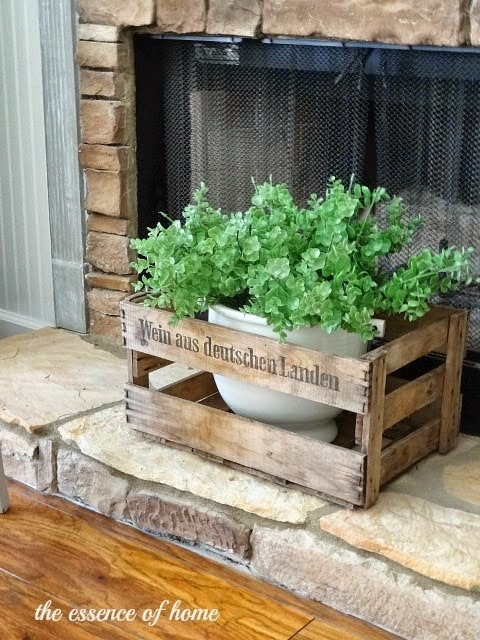 What great tour idea...loved reading about yourself and your blog...I too many times just "post on the fly"...trying to work things in with my day to day commitments..Enjoyed it and have a great day Kelly!...Love the box on the hearth! What a fun post, Kelly! i always love seeing all of your beautiful photos and room makeovers! I am so with you Kelly when you wrote that blogging is a "cyber world of like minded people!" It is very exciting for me to be able to connect with so many people who share the same passions for family home decorating cooking and so on. I have also found that no matter how big and popular a blog is, that blogger is always accessible and helpful. Everything is kept real in blog land and that is very comforting, most especially to new bloggers. Great post Kelly...loved reading all about you and I agree with Shirley...I am crushing on your hearth with the pretty box on it! I was glad to read your post so I would have some ideas on how to answer the 4 questions. I guess I had better start writing my post. I don't think I have ever noticed that gorgeous china cabinet in the corner of the living room - beautiful! I was so excited that I found the magazine at Walmart this weekend! Your home looks wonderful in the photos, but I must admit it was a little strange for me to see so much color in your home! I actually prefer it the way you style it, but don't get me wrong the feature was awesome! I'm finding the "process" blog tours so interesting! I'm fascinated that you are a planner, yet blog "on the fly" many times. I'm even more impressed with your blog now that I know that's how you do it, than I was before (if that's possible, since I love your blog). Great post, Kelly! Oh yes, I certainly did love the tour! So gorgeous and inspiring. Thank you for saying such nice things about me and my blog, and thank you so much for participating in the blog tour. I loved seeing the pictures of your home scattered about the post and reading your answers. #3, spot on for me too. Wonderful post Kelly. LUVED the tour :) Hopping on over to see the other ladies. Kelly, I'm so glad we've met thru blogging and maybe one day we can meet "in real life"! I think you appeal to so many bloggers because you are down to earth and your home is warm and homey...not over the top but tasteful and something many can relate to. i am so happy for your success and wish you many more seasons of blogging! Oh what a fantastic post!! I love your home and it's a pleasure that we met blogging. You are an inspiration to all new and old bloggers. I really enjoy seeing pictures of your home. 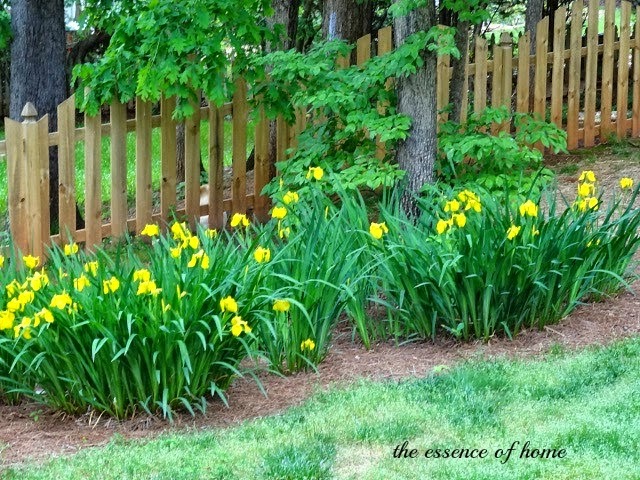 I particularly enjoyed seeing pictures of your yard. So pretty. I can't believe that I haven't found the bloggers that you mentioned.....I'm off to make new friends!!! Thanks!!! Great post and you picked three good ones. Great post!! I'm a list maker too. Enjoyed the blog tour. I picked up a copy of Romantic Country last night...just loved your home and Laurie's too. This was a great post Kelly I really enjoyed it very much. I always love seeing your home and style. It is funny I am a planner with many things in my life but with blogging I just with what is going on at the moment. I just can't wait to get decorating and to projects, cooking and baking again. It has been a long time now. lovely post. I enjoyed reading it! Great job Kelly! I loved reading and finding out more about you. I'll definitely visit the blogs you chose. Great post, Kelly! I'm sorry I missed your post on being published. I'm off to see that after this AND I'll be looking for the magazine. I actually heard about it on someone else's blog. : ) That's the other great thing ~ your good news is passed around the "neighborhood"!